NAUTILUS Minerals says that it has successfully completed the submerged trials for its seafloor production tools in the country. Chief executive Mike Johnston said the overarching objective of the trials was to ensure that all three machines met the requirements of their respective functional design specifications in submerged conditions. “Results to date indicate that they do,” he said. Completing the trials in PNG allowed Nautilus to work closely with partner Kumul Minerals Holdings Ltd, government officers from the various government regulatory agencies, as well as representatives from provincial governments of New Ireland and East New Britain. 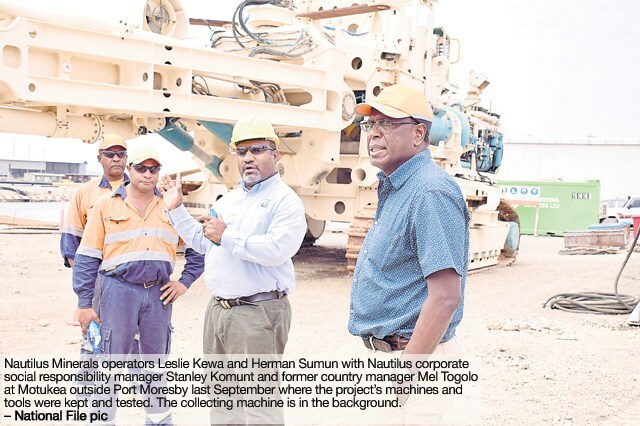 “It also gave community leaders from coastal villages geographically closest to the Solwara 1 site the opportunity to witness the trials of the equipment, and allowed the Company to accrue the economic benefits of the testing activity within PNG,” Johnston said. Meanwhile, the company said the Government has granted a new two-year exploration licence to the company which included new targets. That would allow the company to conduct exploration activities within the southeast Bismarck Sea, Nautilus in a market release said. The exploration licence EL2537 covers 2558sq km, including the same prospective geology that hosts Nautilus’ Solwara 1 deposit. The area was selected based on reconnaissance sampling and surveys completed in 2017. Nautilus acknowledged assistance in this area by the PNG Geological Survey. Johnston said granting of this exploration licence was “excellent news”. “Work done in the area by the company has identified numerous exploration targets, with similar geology to our seafloor massive sulfide deposits found at Solwara 1,” he said.